Pandora and Sirius XM should look at iTunes Radio as a serious competitor. iTunes Radio launched last week to far less fanfare than iOS or the iPhone 5s. But don't underestimate just how important this addition can be to the Apple (NASDAQ:AAPL) family. The new streaming radio service brings radio stations to Apple users, makes iTunes Match far more attractive, and makes it incredibly easy to buy new music from the iTunes Store. It's another piece of a growing ecosystem that keeps consumers with Apple long-term. Apple is far from the first company to offer streaming radio, but it's making a strong push into the area. An ad-supported version of iTunes Radio is free, while the annual $24.95 charge for ad-free radio and iTunes Match is less expensive than the competition, and the product is more integrated into your iPhone, iPad, or Mac than other services. 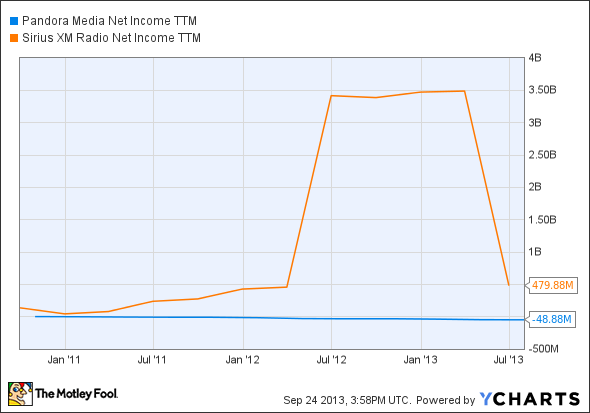 Pandora's (NYSE:P) ad-free radio costs $36 per year and offers similar stations as Apple but doesn't have iTunes Match. For those on the fence, that may be the selling point for iTunes Radio (it was for me). Sirius XM's (NASDAQ:SIRI) music-focused subscription is $159.39 per year, more than six times the cost of iTunes Radio. Sirius XM offers far more than just music, but for subscribers looking for music only, this could be a viable alternative, especially as cell networks fill in gaps around the country. This situation may push Pandora and Sirius XM to cut prices to compete with Apple. That wouldn't be good for either company as they try to grow profits, or in Pandora's case, just turn a profit. P Net Income TTM data by YCharts. Apple has an edge in that it doesn't have to make money on iTunes Radio itself. Part of the appeal is in selling more songs to users and in keeping them in the iOS family. It's almost too easy to buy songs on iTunes Radio, and if you match your music across Apple devices, it's one more reason not to leave the ecosystem. What Apple is really doing with products like iTunes Radio, iCloud, Photo Stream, iMessage, iTunes, and the App Store is creating an ecosystem that's nearly impossible to escape. When Apple has all of your files, music, movies, and notes on its servers, it's difficult to shift to another manufacturer. That's the genius of iTunes Radio, and in my opinion, it's priced to take significant share from competitors.